KUALA LUMPUR, 3 July 2012 – The National University of Malaysia (UKM) is to setup the country’s first specialist children hospital by year end. UKM’s Vice Chancellor, Prof Tan Sri Dato’ Wira Dr Sharifah Hapsah Syed Hasan Shahabudin who announced this today said such a hospital specifically for children needed to be established as children who have different emotional, physiological and psychological make-up cannot be treated as adults. Speaking at the opening of Child Safety, Child Friendly Campaign here today, she said while most hospitals have their own pediatric wards, the children still needed to share facilities with the adults for example in radiology when an X ray is needed to be taken. “It is not fair for children to share facilities with adults as they have to be among adult patients while waiting for their turn. This may not sound so bad but when the adult patient have a serious problem with tubes and oxygen mask on while others are crying in pain, that would definitely leave an impact on children who are still in their developmental stage,” Prof Sharifah Hapsah said. The campaign, a collaboration between pediatricians, pediatric surgeons and students, is part of ongoing activities as a runup to the setting up of the Specialist Children Hospital. The campaign consists of talks and a workshop on injury prevention among children including by President of Child Friendly Healthcare Association of Malaysia, Prof Dato’ Dr Mahmud Mohd Nor. 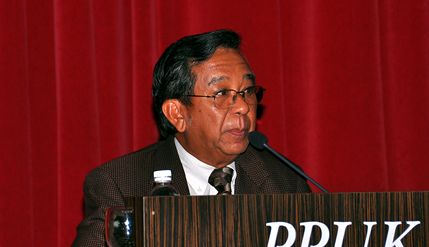 Prof Mahmud, the first Malaysian surgeon to successfully seperate a set of Siamese twins in 1988, is a strong advocate of the establishment of a hospital specifically for children. Prof Mahmud, an Adjunct Prof of Paediatric Surgery (UKM), said he found it difficult to understand why no hospital for children had been setup in the country. “We have integrated our health care for adults and children into a general hospital since independence but children are not small adults,” he said. The concept of children being different from adult was very difficult to be accepted, partly because Malaysia has been successful in reducing its mortality rate. “After independence Malaysia have good primary health care and preventive medicine. We were very successful in bringing down our infant mortality rate which is now even lower than in the United States despite our low budget and low technology,” Prof Mahmud said. He explained that a healthcare premises for children must be a place of healing and not be associated with pain. It is not about having cartoons on the walls or television with the cartoon channels or a ward full of nurses with clown shoes. “This might help but what is important is the children must be cared for as children and not as little adults. A hospital must also not be a place where learning stops. Regardless of what the child is suffering from, learning must continue so that they will not miss out on lessons in school. There should be classrooms for learning with teachers. “Just because a child is hospitalised, that doesn’t mean that he can’t have fun. It must be a place where it is fun to be with playrooms and games”. One of the areas that he stressed on is distraction therapy using games. The success of these elements can be judged when the child is discharged and ask if he can stay on for one more day. Prof Mahmud said if we can achieve this then we have achieved some aspects of child friendly healthcare according to the standards needed for children. Present at the event was Dean of the Medical Faculty, Prof Dato’ Dr Raymond Azman Ali, Deputy Deans, medical practitioners nationwide and developers.